One of the great things – at least I like it – about Taylor series is that they are unique. There is only one Taylor series for any function centered at a given point, What that means is that any way you get it, it’s right. Furthermore, since a geometric series converges only when , the interval of convergence for this series is or and we don’t even have to check the endpoints. There are other choices as well. We could write and then expand the binomial using the binomial theorem. Or we could use the technique of long division of polynomials to divide 3x by (1 – 2x) – leaving the divisor as written here. Okay, it’s not a Taylor Series since a Taylor series is allowed only non-negative exponents, but it’s still a geometric series. Let’s take a look at its interval of convergence: , or , or the union of and , Whoa, that’s different and not even an interval. The original function graphed as a rational expression is shown in black. 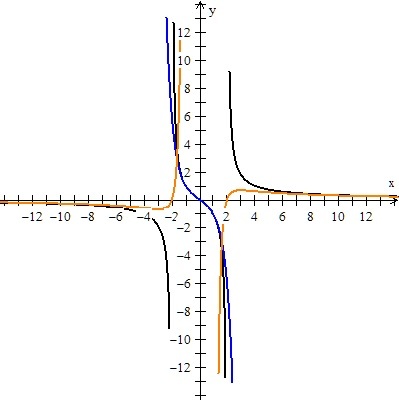 The Taylor polynomial (4 terms) is shown in blue; it approximates the function well between –2 and 2 as we should expect. The red graph is the student’s series (4 terms) and it is a good approximation of the series outside of the interval (–2, 2), far outside! Way Cool! Of course, this kind of series is not studied in beginning calculus. It may make a good topic for a report or project for someone in your class. It’s called a Laurent series. It is a power series centered at oo.